Wooden floors should be installed at the final stage, after any plastering or concrete has fully dried out (allow a minimum of 1 month for every inch depth of concrete, screed or render), and before decorating. The boards should be carefully stacked in the room where they are to be laid (or a similar adjoining room) with each layer separated by sticks or short boards to allow full air circulation (please see separate sheet). Full acclimatisation can take 2 – 3 weeks, depending on whether the boards are new (i.e. kiln dried) or reclaimed. All solid wood floors are liable to some expansion and contraction depending on the relative humidity within the building. This seasonal movement is a normal characteristic of wooden floors and it never stops, regardless of the age of the wooden floor. Central heating tends to dry the atmosphere and so may shrink the boards slightly during winter months. (see our information sheet on House Climate). Generally, the boards should be laid lengthways along the long length of the room. Skirting boards are best fitted after installation of the wooden floor as they will cover the expansion gap (approx 15mm) left around the perimeter of the room. To calculate the square metreage required, multiply the length by the breadth of the room and then a) add 5 – 10% wastage if the boards are end matched (i.e. T/G on ends) or if you are fitting over an existing solid floor or b) add 10 – 15% wastage for laying boards over joists if the boards are not end matched. N.B. we don’t recommend laying solid wood flooring over UFH – Chauncey’s Tectonic engineered wooden flooring should be used instead as it is more stable. The difference in moisture levels between the subfloor, joists or battens and the new wooden flooring should be no more than 4%. For existing timber floors, any damaged or diseased timber should be replaced and any squeaky or loose boards securely fixed. Initially measure from the starting wall the width of your first floorboard plus 15mm for an expansion gap (depending on the room size). Chalk a line on the floor, taking into account that the wall may not be square. Align the first board along the chalk line with the tongue resting on the chalk line and the groove facing the starting wall. Make sure that straight boards are used for this first row and that the whole row is straight. Face nail, glue or screw these boards down. Do the same for the next row or two depending on the width of the boards used. Lay out the flooring in advance to achieve a random pattern. When the final board of any row needs cutting the remaining piece can be used to start the next row, thereby reducing wastage. It is advisable to stagger the end joints of the boards by at least 150mm and to use variable length boards, which will give the traditional look of a hardwood floor. You can cut out any knots etc. as you wish, but extra allowance must be made for this within the wastage factor (see Planning). Alternatively, these boards can be used in a less conspicuous position. The last few rows must be fitted similarly to the first few rows remembering to leave the expansion gap all round the edge of the room. This gap is traditionally covered by skirting but can also be covered by 19mm moulding, (fastened to the walls, not the floor) if the skirting is already in place. For screeds/concrete: Glue boards to the concrete using Sikabond T2, T52 or T54. (Please see separate sheets for information). Alternatively, timber battens approx. 50 x 25mm can be fixed to the floor at approx. 300mm centres, or a subfloor of plywood or chipboard can be fixed first to the concrete, leaving a 5mm gap between sheets. For Existing wooden floors: A new wooden floor should be laid at right angles to the existing boards, or, if you wish to lay new boards in the same direction,a layer of plywood (min. depth 4mm) can be fixed between old floor and the new. The floor can then be secret nailed, surface nailed, or glued wih Sikabond. Please ask us for advice on soundproofing. For Joists: Depending on the span between joists, solid wood boards must be at least 18mm thick to form a supporting floor, or must be installed over a layer of exterior grade plywood of at least 18mm thickness (for min. depth allowed consult your Local Authority Building Regulations). Install the solid hardwood planks at right angles to the joist system. Fix the boards with a secret nailing gun. Nails should be at least 75mm from the end of the board and boards should be nailed to every joist. Boards which are end matched (i.e. T/G on end of board) can be joined between joists; square edged boards must be cut back to a joist. 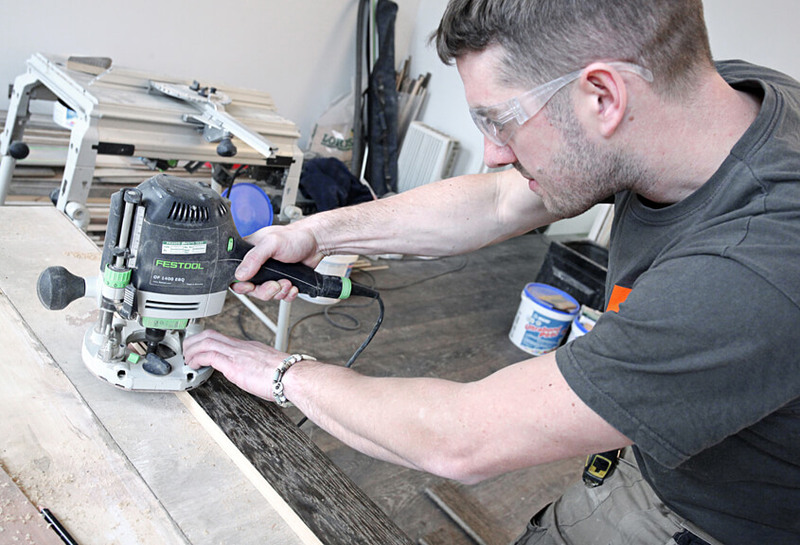 Wide Boards: For fixing 180mm boards and wider to an existing wooden floor or joists, secret nailing needs to be combined with fixing the opposite edge of the boards – either by surface nailing the board or by using dabs of Sika T2 adhesive. Sanding must be carried out carefully and methodically to avoid unsightly scores or ridges. It is best to hire an orbital finishing sander for the main part of the room and also an edge sander. New boards with a micro bevel may not need sanding at all, and those without a micro-bevel will require a fine sanding only. Reclaimed boards may require slightly more sanding. If required any knots or blemishes can be filled with a wood filler. In order to get a good colour match, the ‘wood flour’ from the final fine sanding can be mixed with a clear resin (e.g. Lecol 7500). The areas filled will then need a final sanding before finishing. N.B Please note that this laying advice is for guidance only – we would always recommend using an experienced fitter to lay our floors. Chaunceys cannot be held responsible for any problems encountered due to following the above advice. The Chaunceys name is synonymous with high quality flooring and our fitters take great pride in their work. Each project is unique and Chauncey’s Fitting Services will ensure that customers receive the best service from start to finish and the best possible floor. All our flooring is from sustainable sources.